Incredibly well done to Oscar!! 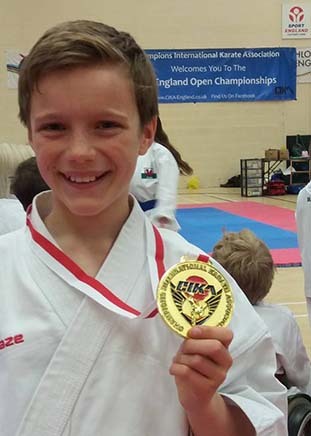 Third time British International Open karate champion. Pictured here looking deservedly happy with another trophy. Well done to Oscar for another outstanding performance in the Central England Open Karate Competition. A hard earned silver after six rounds and only dropping two flags in the final. Outstanding work, Oscar! 3 competitors, 2 golds and 3 bronze medals. Well done Manon, Joseff and Oscar! Huge congratulations to Oscar on winning a hard-earnded bronze medal! With over 40 competitors and some very high standard it was another very good day for Yoshitaka Karate Club. Remember, if you are interested in joining the competition squad, please have a word with Sensei. Well done to Manon, Joseff, James and Oscar for representing Yoshitaka with some amazing performances, showing such progress and good sportsmanship. Congratulations to James Cockrill on winning Bronze in KA6 Under 12 Karate Kata at Carmarthenshire Open Karate Competition. Well done James! 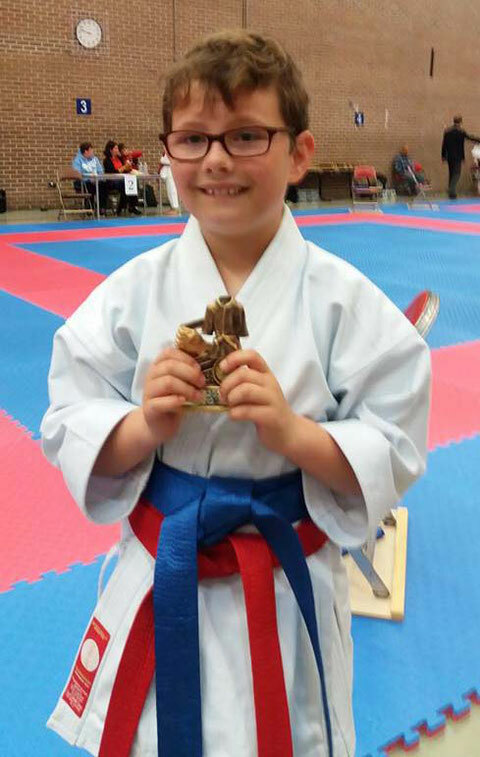 Wonderful performance from Oscar Wood who has won a well deserved Gold medal in the Under 12 Kata competition. Outstanding work! Well done, Joseff for getting through to the second round - awesome work. Yoshitaka took our largest squad yet to this competition, with new competitors Sam & Seren Parfitt, and Alex & Mikey Phillips in their first big competition. Special mention to Harry & Daisy who won the pairs competition, despite NEVER having trained together - with Daisy stepping up in the day. Well done also to Mikey, Sam & Seren who performed really well on the big stage for the first time. Well done to a small squad who travelled to Penrith to compete at the Cumbria Open. A huge well done to Luke who was competing in the U16's for the first time, making it through 2 rounds, and also to Gabby in the U13's where she drew the eventual champion in the first round, but narrowly lost 2 - 1. 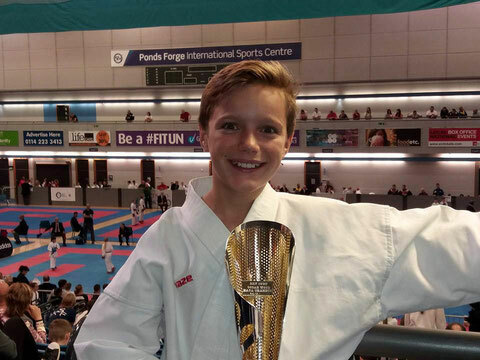 Yoshitaka has a fully fledged British Champion in Oscar Wood who won GOLD in the U12 Kata at this prestigious event - well done Oscar!. Congratulations to Harry Davies & Luke Morgan who won BRONZE in pairs U14 Kata, and well done to Gabby Harris who competed in her first British Championship. Superb results from the W.K.U. championship in Western-super-mare, with the squad picking up 3 silvers and 3 golds. And another great effort from Gabby Harris. A fantastic day, our squad of 8 competitors winning 7 Gold, 2 Silver and 2 Bronze medals. 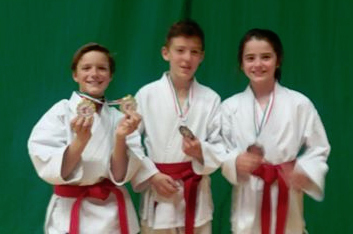 A massive "Well Done" to Welsh Champions :- Daisy Taylor, Gabby Harris, Luke Morgan and Harry Davies. A special mention to Lucy Davies who attended her 1st competition today and Oscar Wood for taking part in his 1st kumite. Onwards and Upwards guys !!!! Another amazing performance by Harry up against competitors from across Europe and Russia, only losing 2 flags through the entire competition. Harry, Luke and Oscar picked up 3 Gold medals and 3 Silver medals. Awesome performance from the three boys. Amazing performance by 'Team Yoshitaka' at the W.K.G.B Open on Sunday 12th October. A large number of Yoshitaka students attended St Pats for a great day of competition. Well done to all of the students for a hugeeffort in what was, for many, thier first competition. European level competition attended by nearly 700 competitors from Austria, Germany, Croatia, Switzerland, Bosnia, Nepal, Serbia and Wales. 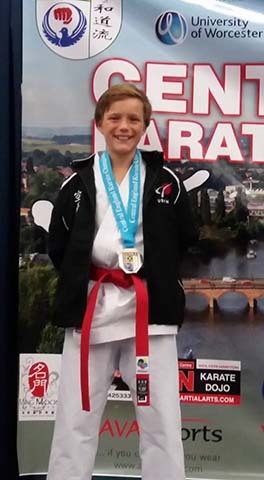 The standard was very high and Harry Davies manged to win both his individual category, and along with his team mates from Cardiff, Cory Giles and Laurence Armstrong also the boys team kata. Well done to Harry! We are very proud of you. Well done to Harry & Steffan for a great season. Harry competed in the UK Open on Sunday 16th February and did us all proud, he won a bronze in individual kata and kumite and along with Cory Giles and Laurence Armstrong from our sister club, St Pats Karate Club in Cardiff, won the U14 team kata and team kumite - a fantastic achievement by any standards with our boys being only 10 and 11 years old. Keep up the good work boys and well done Harry !!!! Previous years competition results are available at the Competition History link. Although not mandatory for Yoshitaka students there are multiple opportunities for Karate-ka to compete in either Kata (forms) or Kumite (fighting) or both at various levels. The United Schools of Karate Wales annually holds an internal Kata competition which is a great place to start competing. There are also local/regional and national mixed style championships that Yoshitaka students are encouraged to enter when they are ready to do so. 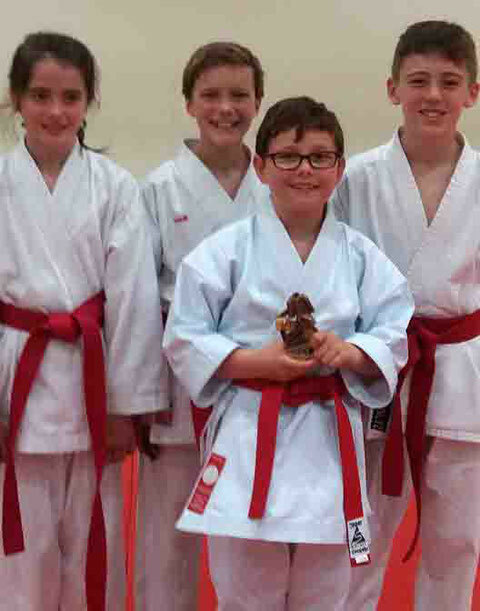 Through the affiliations of the United Schools of Karate Wales all club members can compete in a range of all-style karate competitions at national and international levels. Many local Karate Organisations also hold championships which Yoshitaka Karate Club regularly supports and if you would like Yoshitaka to attend your competition please do contact us.